Christopher Gray was a major figure in the rising swell of interest in New York City architectural history that began in the aftermath of the demolition of Pennsylvania Station. With a degree in Art History from Columbia in 1975, Chris founded the Office of Metropolitan History that same year to provide research services to historic architectural questions. His research provided historical accuracy to many publications, thereby raising the standards for the field. He became widely known to the public for his column Streetscapes that ran from 1987 to 2014, one of the highlights of the Sunday New York Times Real Estate section. Chris and his staff from the OMH, Suzanne Braley, Melissa Braverman, and Samantha Hightower, were frequently seen at Avery pursuing countless citations, photographs, and drawings. 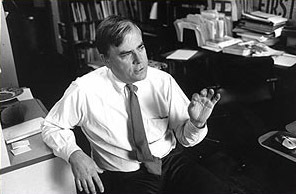 Avery Library extends its sympathy to his wife, Erin D. Gray, a graduate of Columbia University’s Historic Preservation program, and his family. This entry was posted in Art Properties, Drawings & Archives, Uncategorized on March 16, 2017 by Ted.